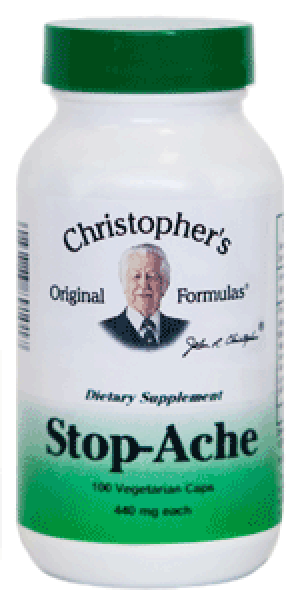 Dr. Christopher's Stop-Ache is a synergistic blend of herbs for temporary relief of minor aches & pains. White Willow Bark, Feverfew Herb, Clove Powder, Hops Flower, Lobelia Herb, Valerian Root, Wild Lettuce Herb & Wood Betony Herb. Description: Dr. Christopher's Stop-Ache is a synergystic blend of soothing herbs known to aid with temporary pain discomfort.